Earlier today it was revealed that Jolla may be unveiling their debut smartphone as early as next month. That certainly got many interested, especially since the news came via an interview with Jolla chairman Antti Saarnio. The interview was conducted in Finnish, however, which gave rise to potential misquotes and “lost in translation” scenarios. On the other hand, a few hours ago Jolla’s Twitter account began retweeting those reports, including ours. 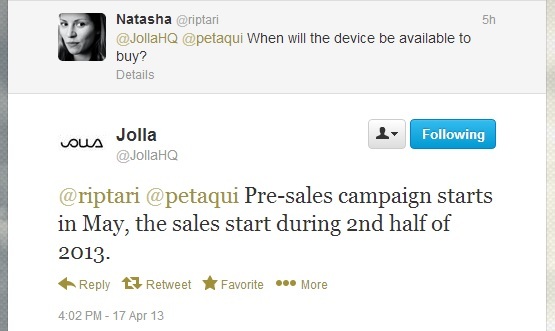 Eventually, Jolla confirmed the news. The Finnish startups will finally announce their long-awaited first Sailfish-based smartphone next month. According to a statement published on TechCrunch, Jolla confirmed that it will indeed showcase its first device next month, and that its pre-sales campaign “is currently being planned” and will be announced together with the device. Once again, any details regarding Jolla’s first smartphone remain shrouded in mystery. On the other hand, Jolla was also quick to quash rumours about a possible crowd-funding initiative being part of the pre-sales campaign. Instead, the company stated that the pre-sales campaign would be to allow “fans to sign up their interest and make sure they get the device first”. Regardless, the company is building up momentum nicely as they prepare for the launch of the device in the second half of this year.